Whenever there is something wrong in my life, there is something wrong with me. It amazes me how many people I know who don’t get this simple concept. Life really is all about you. Our choices and our reactions to circumstances create the climate of our existence. It is simply a case of cause and effect. For months now, there has been a seemingly healthy, young man who daily, sits across the street from where I work with a cup out in front of him and begs for money. The first couple of times I saw him there, I helped him out with a fiver or whatever change I had. It was obvious that he was embarrassed to be begging and I felt for his plight. After seeing him repeatedly begging I asked him what his story was. He told me that he had worked at the local newspaper as a printer but the paper laid off the younger workers and kept the older ones on because they had more seniority. I suggested to him that if he wanted to stay in that industry that perhaps he needed to try a different town to get a job because what he was doing right now was obviously not working for him. Six months later and he is still begging. Now I don’t know if what he told me was the truth and I don’t know if there is something else in his personal life that he is struggling with but life is most certainly not working for him and he is not getting that he needs to look to himself for the solution to the problem. Whenever there is something wrong in my life, the universe is giving me an opportunity to grow. But there is more here to this law. 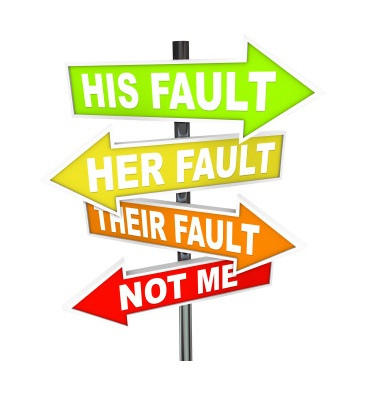 It’s one thing to see a problem in your life that is holding you back from reaching your full potential but when you choose to blame others for your misfortune then you are either willingly or unwillingly putting blinders on to the issue and that is wrong. It’s all about taking responsibility for your very existence. Shits gonna happen. External forces are gonna work against you. That’s a universal law too or at least a Murphy’s law! You do not get to choose your parents or your upbringing. You do not get to choose what part of the world you were born nor do you get to choose whether you were born a girl or boy or whether your body is whole. Those are the cards of life we are dealt this time around. What you do get to choose, and is your responsibility and only your responsibility, is what you do with the circumstances that you were handed from this and every moment forward. There are things, that I need to do, or things that I have promised to do, but; I’ve allowed days to pass, or spent time on ‘things’ that are irrelevant, so…..